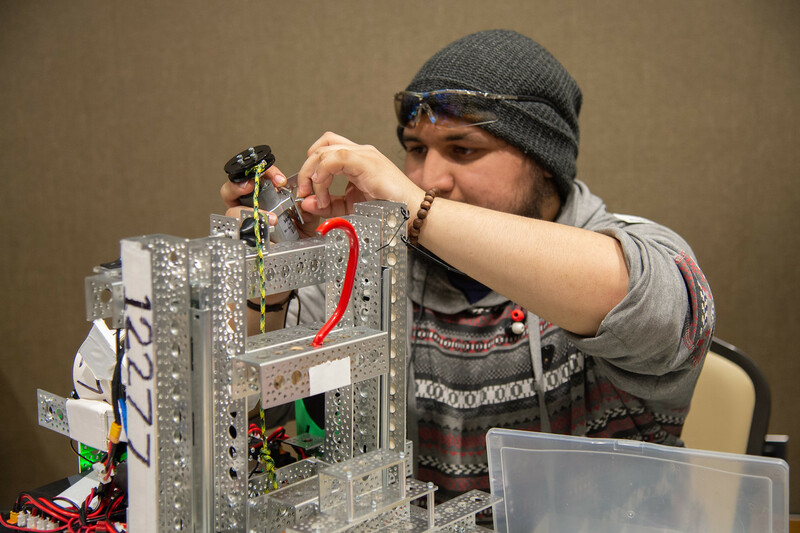 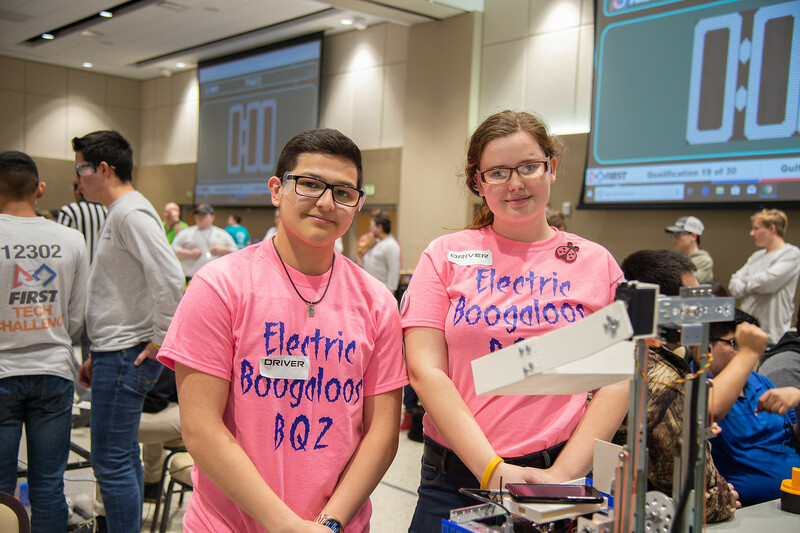 CORPUS CHRISTI, Texas – After months of hard-work and dedication, 26 Coastal Bend area teams went head-to-head during the FIRST (For Inspiration and Recognition of Science and Technology) Tech Challenge (FTC) Gulf Coast League Championship, hosted by Texas A&M University-Corpus Christi on Saturday, Jan. 26. 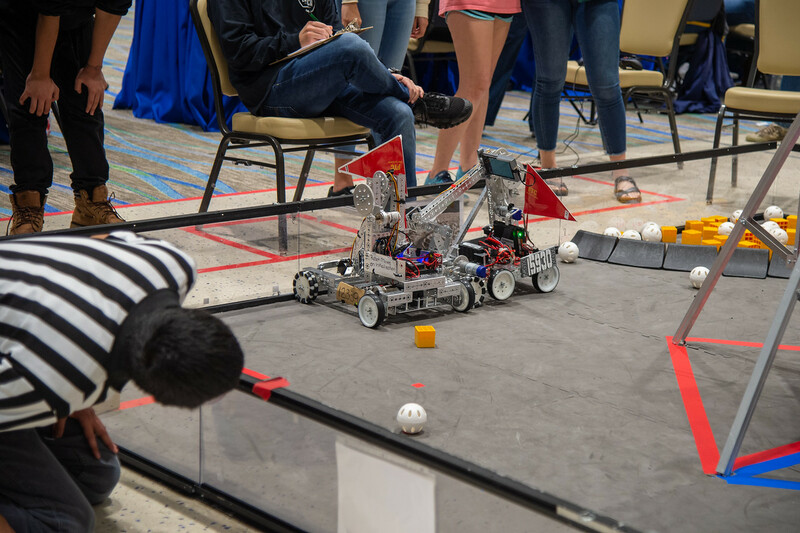 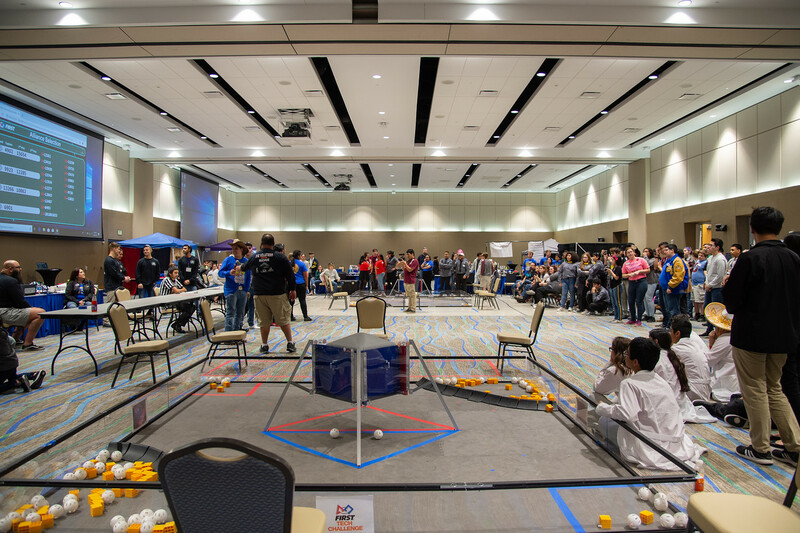 The teams competed for a place in the FTC Alamo Regional/State Championship in New Braunfels. 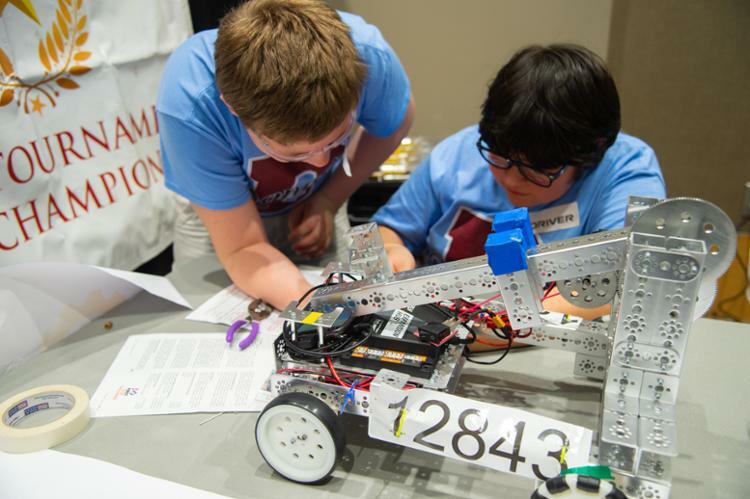 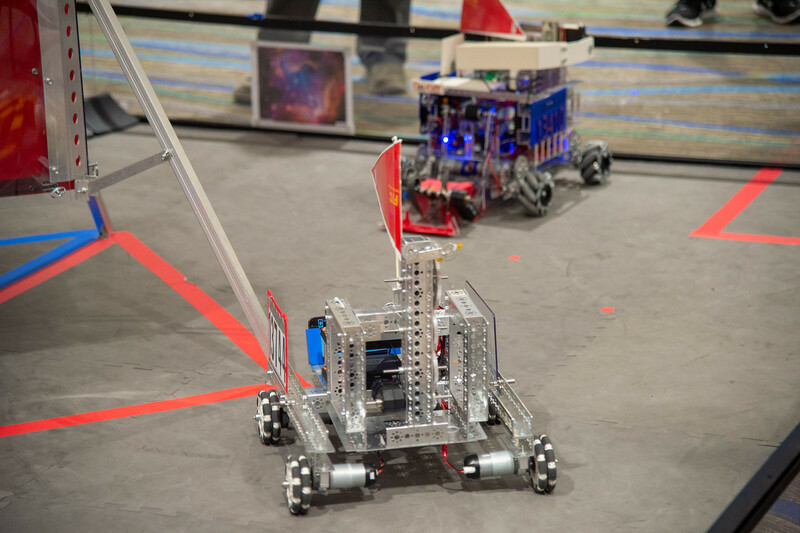 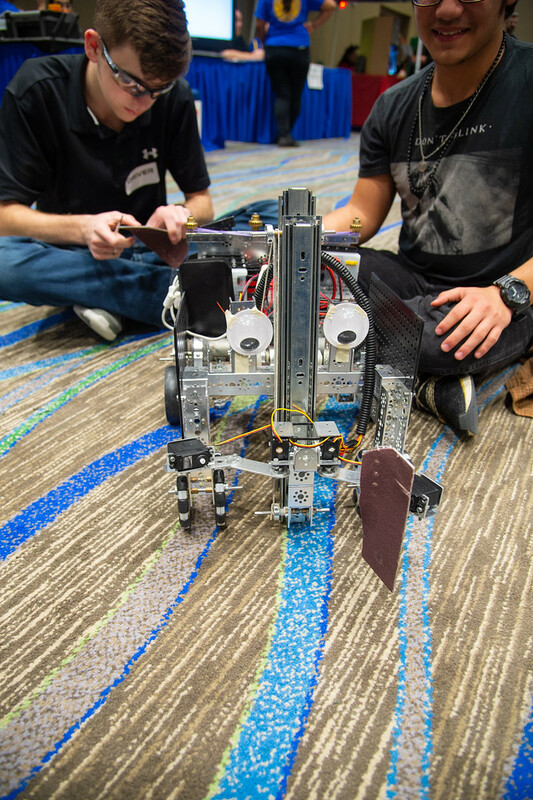 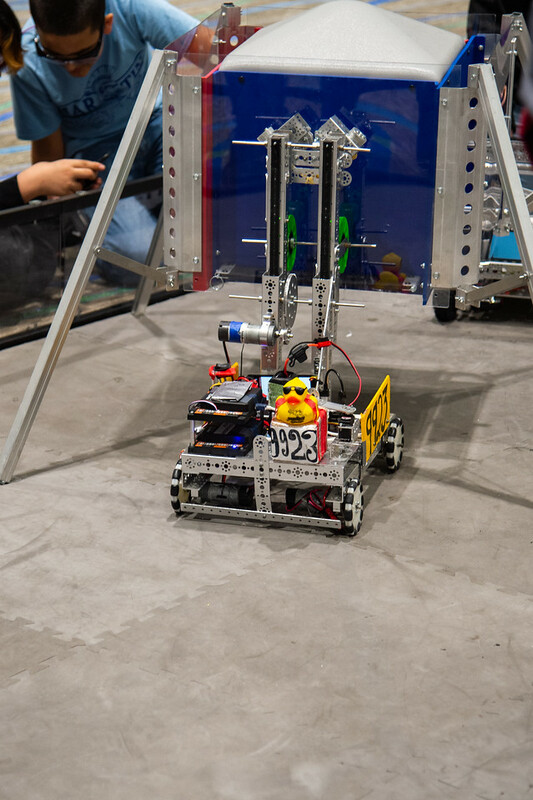 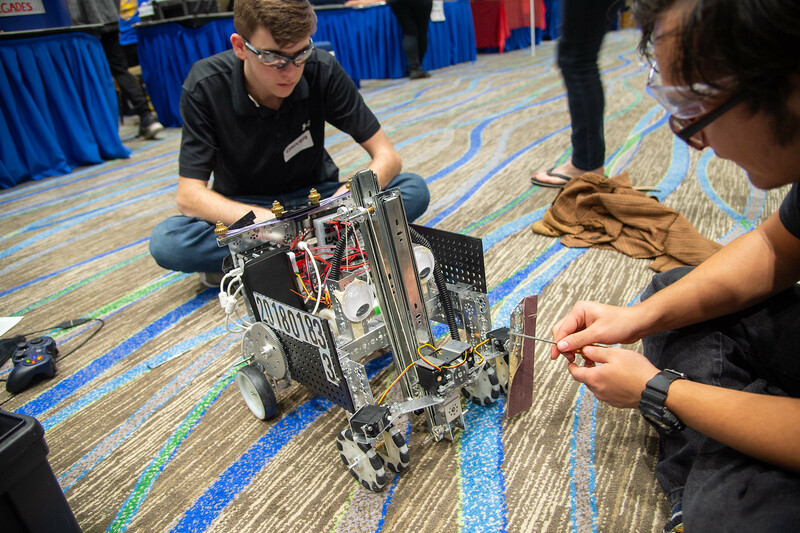 More than 200 students from grades 7-12 built, programmed, and operated robots of their design. 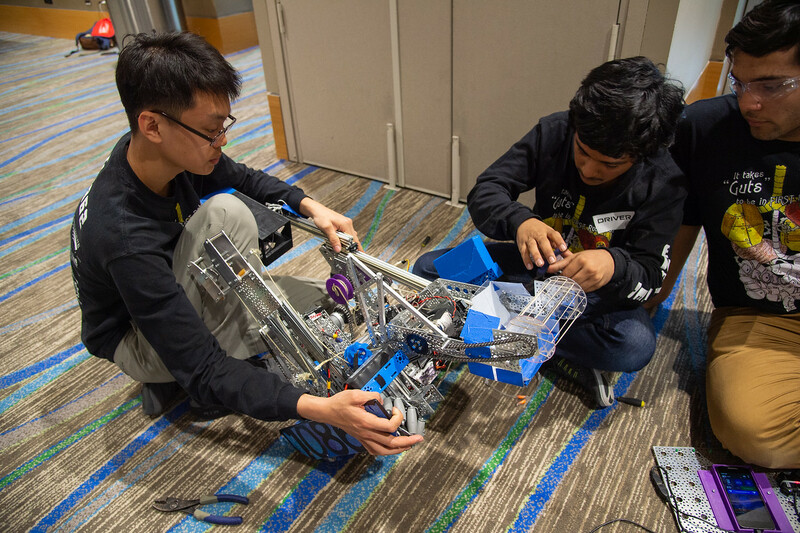 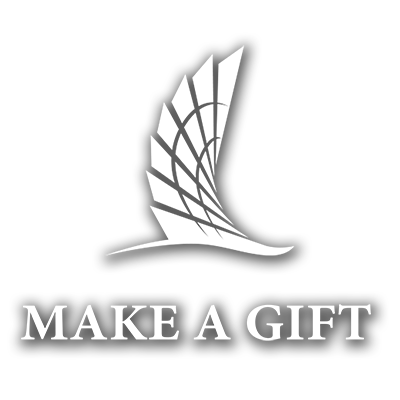 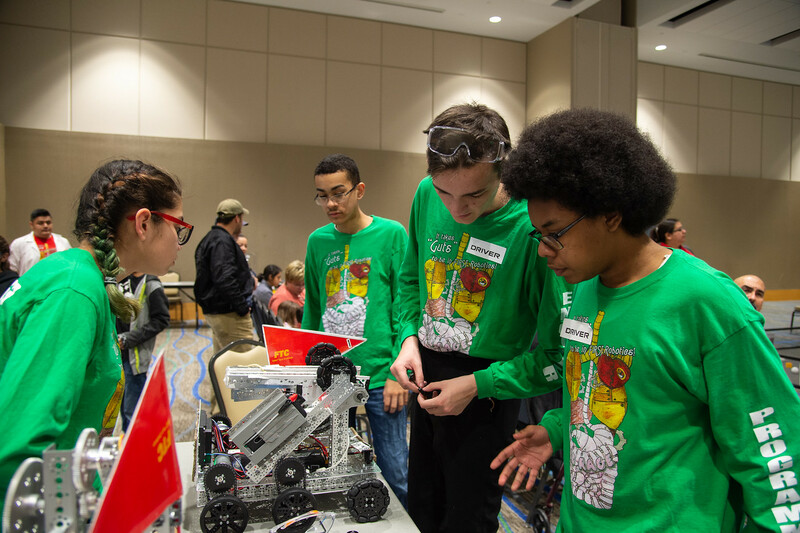 Guided by coaches and mentors, they developed science, technology, engineering, and mathematics (STEM) skills and practiced engineering principles, while realizing the value of diligence, innovation, and teamwork. 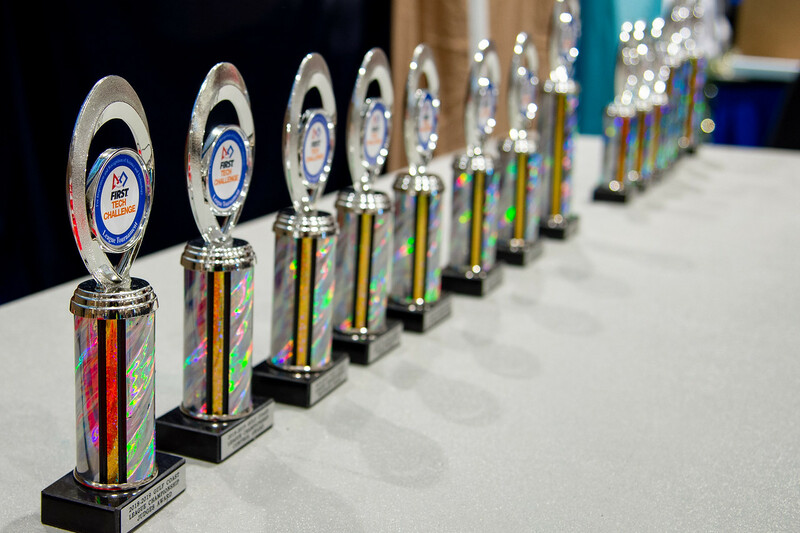 Every year, the competition has a different challenge. 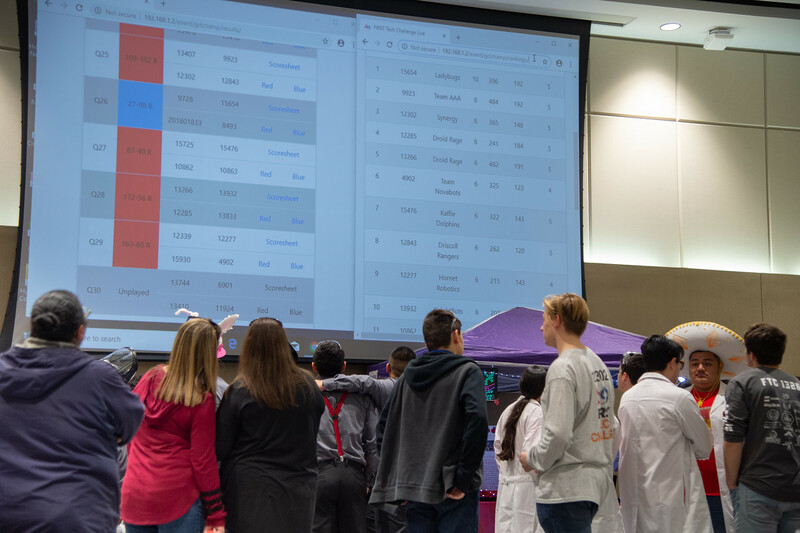 This year’s theme, Rover Ruckus, was a space mining simulation that imitated a potential real-world situation in robotic planetary exploration. 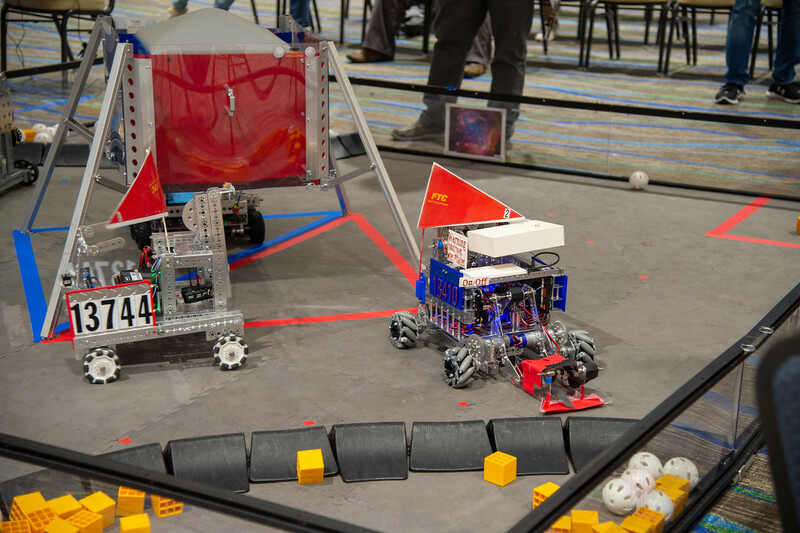 Matches had two distinct periods of play: a 30-second autonomous period, where the robot operated using pre-programmed instructions and sensor inputs, followed by a two-minute driver-controlled period, where the robots were directed with a remote similar to a video game controller. 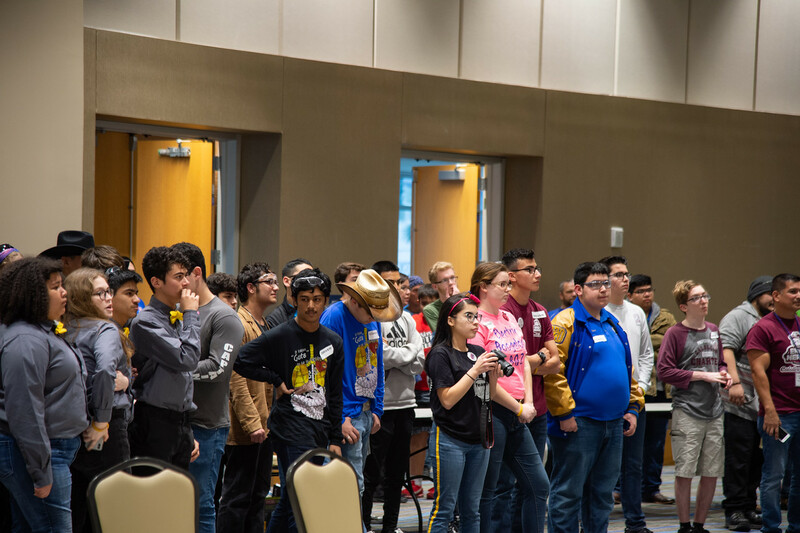 Onlookers watched with anticipation as the student-designed robots descended from the lander, located in the field’s center, to compete to score the most points by collecting and sorting minerals from the craters, located in opposite corners of the field. 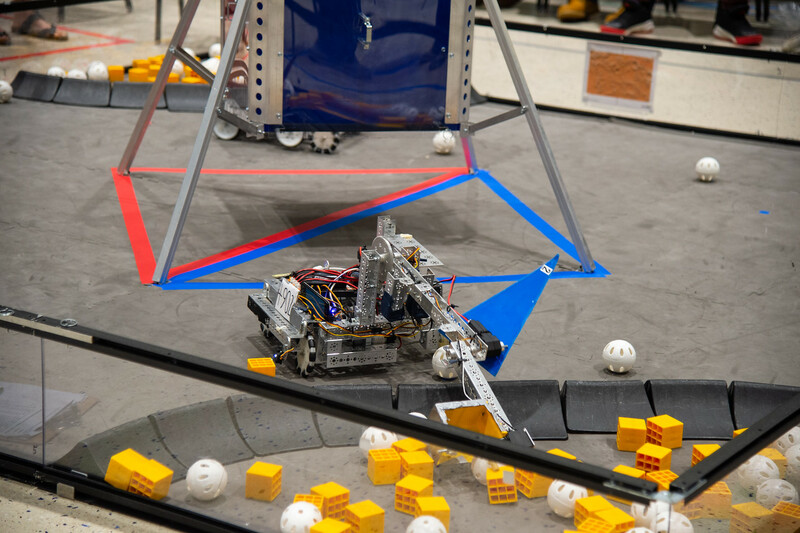 The scoring elements consisted of 60 silver minerals and 90 gold minerals, which were represented by white spheres and yellow cubes. 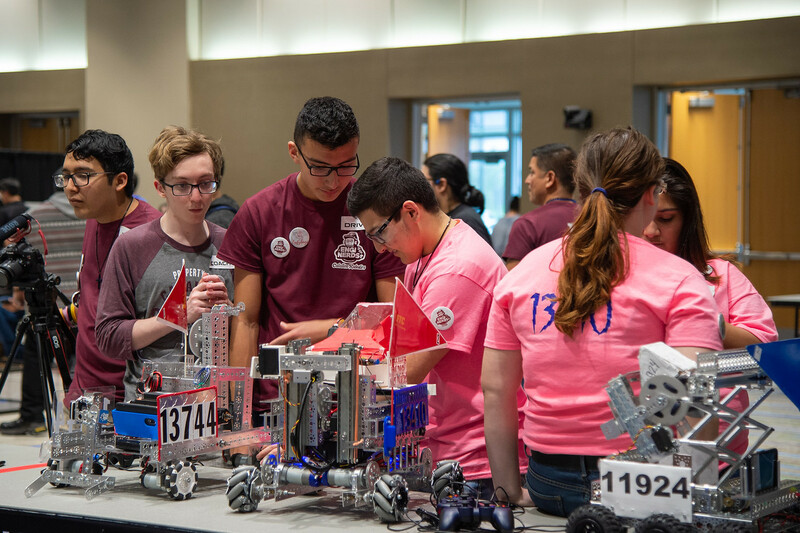 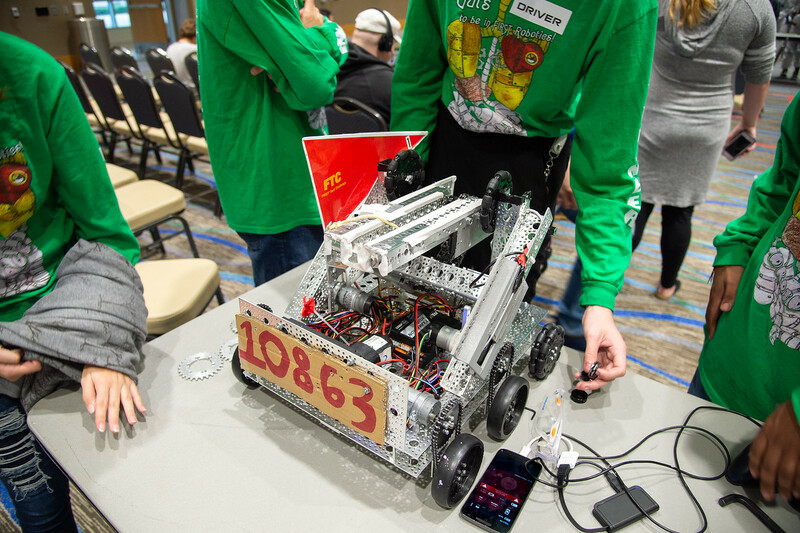 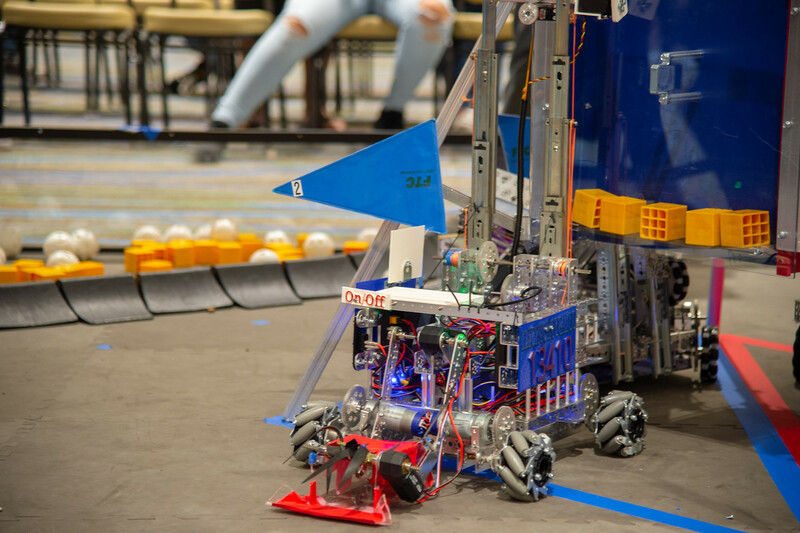 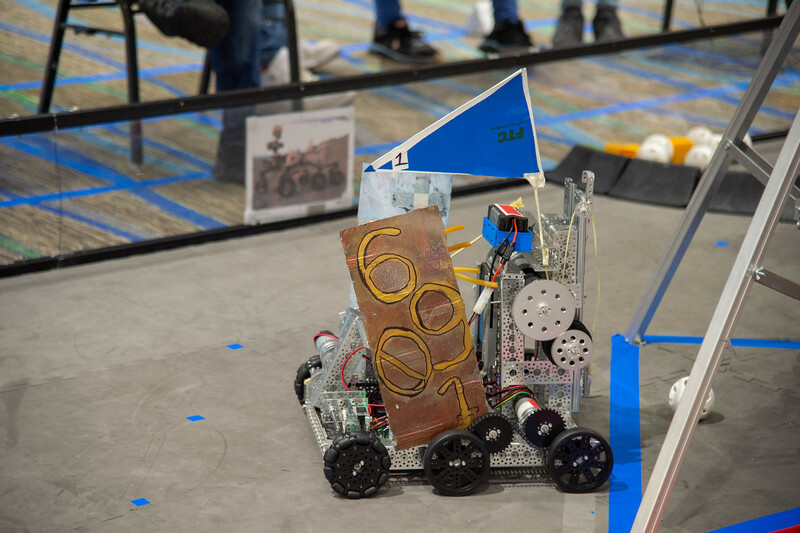 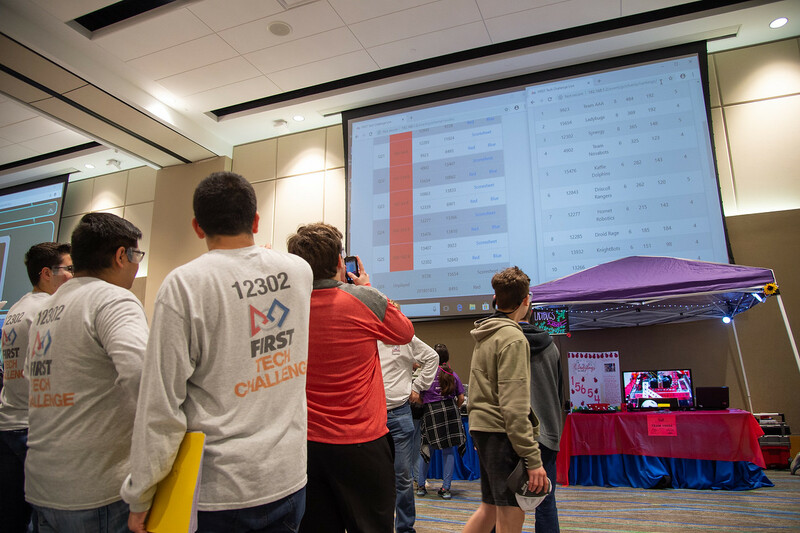 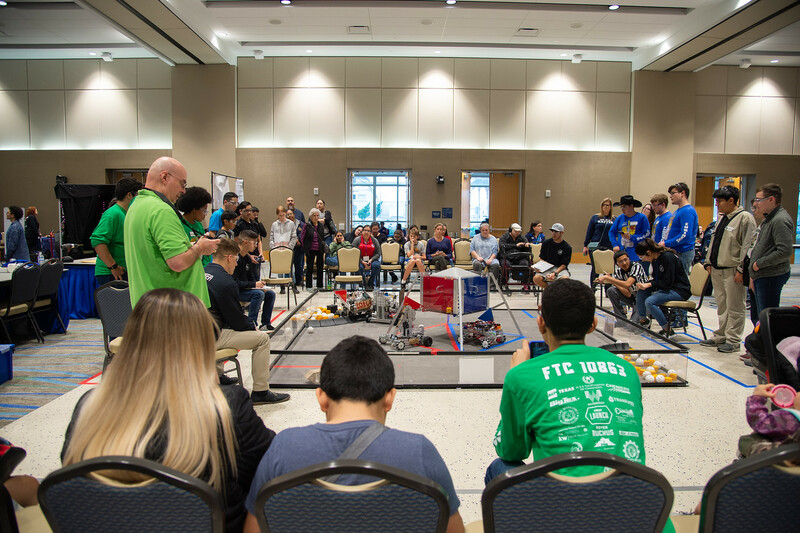 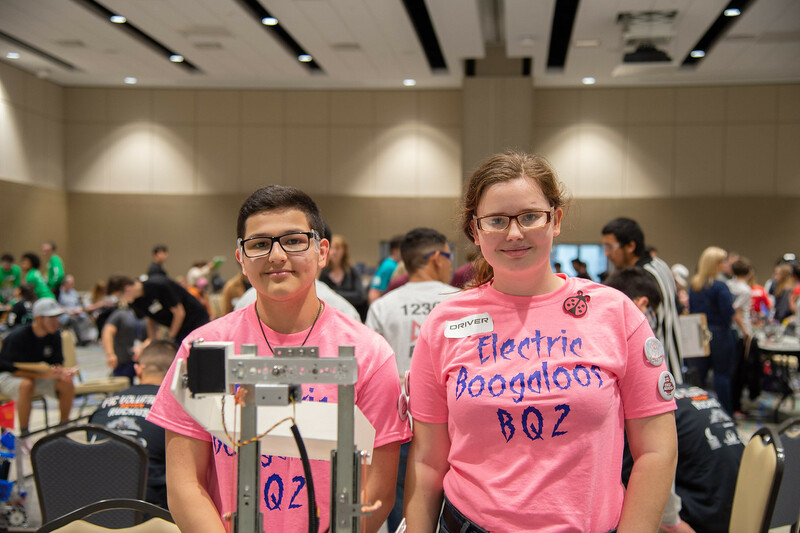 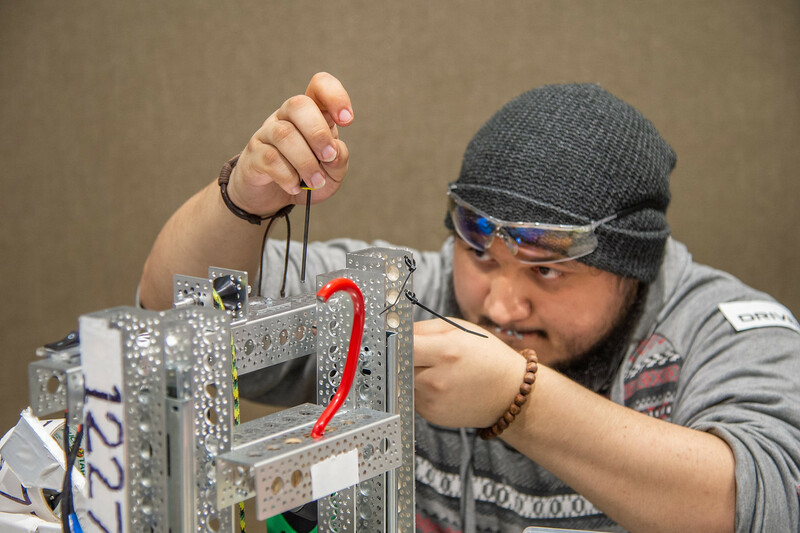 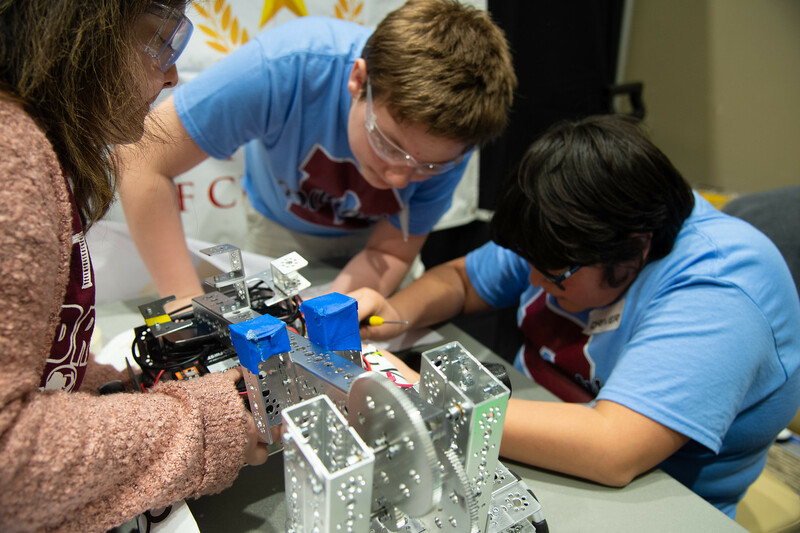 The teams were not only judged by their robot’s performance, but also by how detailed they kept their engineering notebook, their performance during faculty interviews, and their displays in the pit, where students shared information on their projects at booths during the competition. 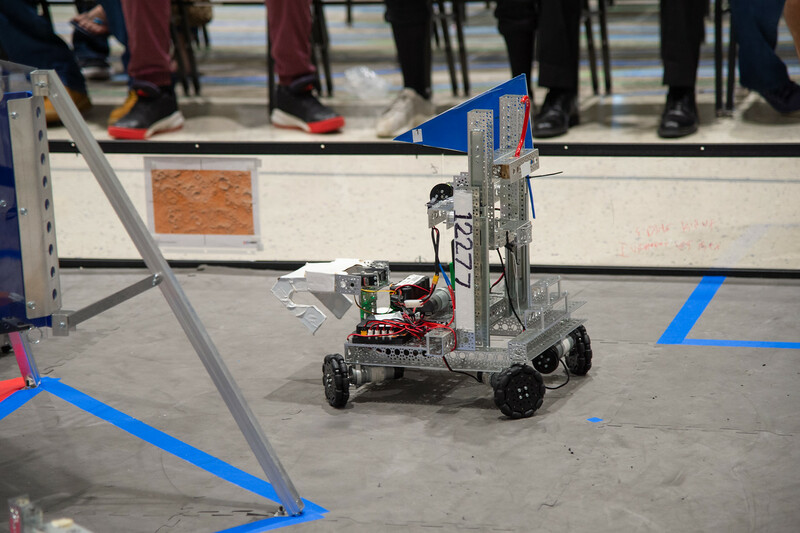 One team spent 246 hours working on their robot. 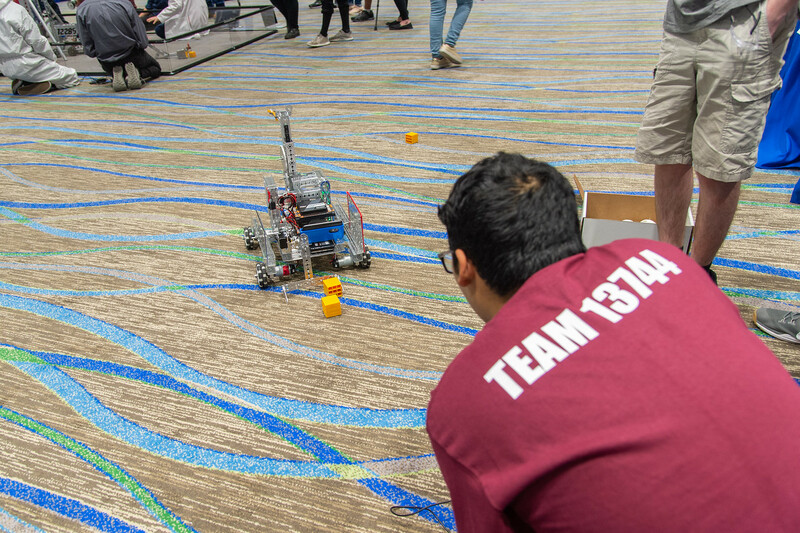 Teams also performed outreach events in their communities to engage younger students.